Figure 2 Anatomical and physiological pathways for site-specific delivery. Source: From Ref. 5.
macromolecular assemblies and hence cannot enter into cells by such simple processes. Instead, they are taken up by a process called endocytosis, which involves internalization of the plasma membrane, concomitant with engulfment of the extracellular material. It is divided into two types: phagocytosis and pinocytosis. The former refers to the capture of particulate matter, whereas the latter represents engulfment of fluids. Various (endocytic) mechanisms by which macromolecules can enter into the cell have recently been reviewed by Bareford and Swaan (6). Figure 3 (A) Phagocytic and (B) pinocytic uptake of drugs. immunoglobulin A (IgA) and secretory IgA (slgA), called dysopsonins impart a high degree of hydrophilicity, leading to significantly decreased uptake by cells (7,8). Thus, the extent to which a drug is opsonized, and by what plasma protein, determine the uptake mechanism. This in turn depends on the size and surface characteristics of the particles (9). In general, smaller-size particles are better taken up by cells. Interactions between the colloidal/particulate carriers and blood components mostly involve long-range electrostatic, van der Waals, and short-range hydrophobic types (10,11). Changes in the glycoprotein levels have also been suggested to cause variations in the opsonization of administered particles and, consequently, their ultimate distribution in the body (12). Particles with higher hydrophilic surface characteristics, for example, through coatings/ coupling with polymers, such as polyethylene glycols (PEGs), poloxamers, or poloxamines, also undergo opsonization to a lesser extent and, consequently, exhibit decreased phagocytic uptake (13-16). This offers opportunity to target drugs to cells other than those of the reticuloendothelial system (RES), because the longer the drug stays in the central circulation, the greater the chances of uptake by other cells. Nonspecific phagocytic uptake of particles, triggered by particle size and hydrophilic coatings (17) and mediated by membrane components (18), has also been reported. 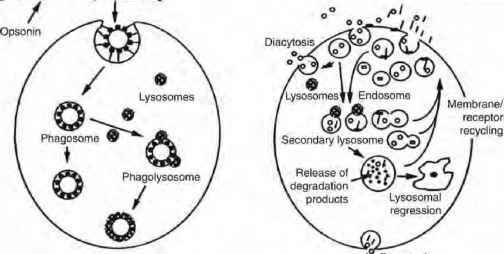 Following ingestion, the phagocytic vacuole (or phagosome) fuses with one or more lysosomes to form phagolysosomes (or secondary lysosomes) (Fig. 3A). It is here that the digestion of particles by lysosomal hydrolases (e.g., proteinases, glycosidases, phospholipases, phosphatases, and sulfatases) occurs, making the drug available to exert its therapeutic effect. The internal pH of lysosomes ranges between 4.5 and 5.5. Compared with phagocytosis, pinocytosis is a universal phenomenon in all cells, including phagocytes. Unlike phagocytosis, which is mediated by the serum opsonin, pinocytosis does not require any external stimulus. Pinocytosis is divided into two types: fluid-phase pinocytosis and adsorptive pinocytosis (Fig. 3B). Fluid-phase pinocytosis is a nonspecific, continuous process. It serves as a means to transport macromolecular constructs lacking targeting ligands through epithelia, some endothelia, and into various blood cells. Molecules taken up by this route avoid direct binding with the membrane constitutes. Adsorptive pinocytosis, in contrast, refers to internalization of macro-molecules that bind to the cell surface membrane. If the macromolecule adheres to a general cell surface site, then uptake is referred to as simply nonspecific pinocytosis. However, if it binds to a specific cell receptor site, then the process is called receptor-mediated pinocytosis. Before membrane internalization, the pinocytic substrate often patches into domains or areas of the membrane called coated pits. Coated pits have a cytoplasmic coat consisting of clathrin and other proteins such as caveolin-1. Once internalized, the pinocytic vesicles can interact among themselves or with vesicles of other intracellular origins, such as endosomes and lysosomes. Endosomes are rich in pinocytic receptors. The pH within endosomes ranges between 5.0 and 5.5. The mild internal acidic pH condition induces dissociation of the receptor-drug carrier complex, freeing the receptor for recycling. Endosomes also help in routing engulfed substrates to their appropriate intracellular destinations. Substrates (macromolecules) internalized by the clathrin receptor-mediated mechanism (known to occur with targeting ligands such as transferrin, mannose-6-phosphate, and riboflavin) are believed to remain intact in the endosome and are usually transferred to the lysosome, where their digestion by acid hydrolases occurs. Ligands such as folic acid and low-density lipoproteins (LDL) support caveolin-assisted endocytosis. Substrates internalized by this pathway are transferred to nonlysosomal compartments, such as endoplasmic reticulum. In some cells, for example, endothelial cells, the endosomes, instead of transferring their contents to the lysosome, release them outside the cell. This process is termed diacytosis or retroendocytosis and can achieve a vectorial translocation of substances (19). In cells, such as secretory polymeric IgG in the neonatal gut, polymeric IgA in hepatocytes, and LDL in endothelia, the secondary lysosome transports its contents to the other side of the membrane by a process called transcytosis. The secondary lysosome can also regress to form residual bodies that continue to retain nondegraded macromolecules. Nonspecific pinocytic uptake appears to be dependent on the size (molar mass and configuration), charge, and hydrophobicity of the pinocytic substrates. Poly cation macromolecules have increased pinocytic uptake in rat yolk sacs and rat peritoneal macrophages cultured in vitro, compared with neutral and anionic macromolecules (20-22). Recently, positively charged hydroxypropyl methacrylamide conjugates have also been reported to accumulate in greater amounts in cells than their negatively charged counterparts (23). The rate of pinocytic uptake in different cells has also been reported to increase with an increase in hydrophobicity of the substrates. The molecular size of the pinocytic substrate is also detrimental to the movement of macromolecules from one compartment to another. The receptor-mediated form of endocytic uptake, compared with nonspecific pinocytosis, provides a more rapid means of cellular uptake (24,25). It has been identified for a wide variety of physiological ligands, such as metabolites, hormones, immunoglobulins, and pathogens (e.g., virus and bacterial and plant toxins). Several endosomotropic receptors identified in cells are listed in Table 2 (5). A number of cell-adhesive ligands, such as proteins and peptides containing tripeptide Arg-Gly-Asp (RGD) sequence and intercellular adhesive molecules (e.g., ICAM-1) antibody, have also been investigated for targeting drugs to cancer and other diseases (e.g., autoimmune) (26). 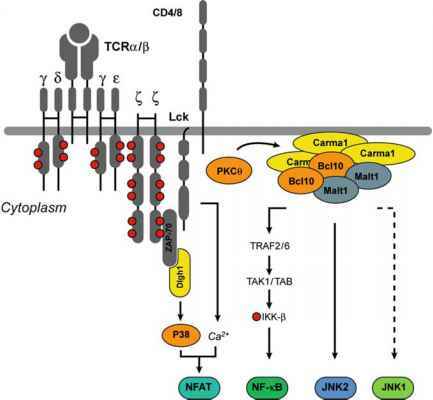 RGD specifically binds to the integrin receptors (0CvP5 or avpe) present on cells.